Founded in 1986 and headquartered in Washington state, Electroimpact is a key supplier of major aerospace companies around the world. Focused on building large machines and tooling, Electroimpact specializes in integrating factory automation and tooling to deliver custom production solutions to their clients. Electroimpact’s products, among others, include CNC drilling machines, wing panel and spar machines, and aircraft assembly fixtures. Electroimpact adopted SpatialAnalyzer® (SA) seven years ago because they liked its analytical capabilities. Founded in 1986 and headquartered in Washington state, Electroimpact (www.electroimpact.com) is a key supplier of major aerospace companies around the world. Focused on building large machines and tooling, Electroimpact specializes in integrating factory automation and tooling to deliver custom production solutions to their clients. Electroimpact’s products, among others, include CNC drilling machines, wing panel and spar machines, and aircraft assembly fixtures. Electroimpact adopted SpatialAnalyzer® (SA) seven years ago because they liked its analytical capabilities. Most notably, SA’s sophisticated uncertainty analysis tools and the flexibility it offers in bundling instruments and networks appealed to the engineers of Electroimpact. Today they use many of SA’s analytical tools to model complex uncertainty interactions and prepare for measuring needs before they are on a customer’s site. They also use SA to model and present different metrology solutions, which allows them to predict measurement performance and validate recommended solutions during the proposal process. When it comes to large multi-axis CNC machine compensation, SA comes in handy in more than one way. 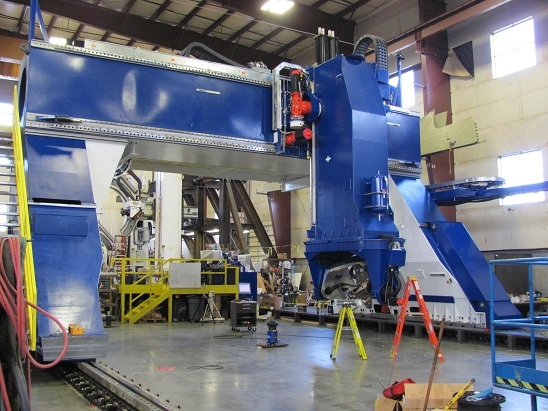 Large CNC machines present a unique challenge for efficient and accurate volumetric compensation, particularly in aerospace applications where extremely tight tolerances are required. Electroimpact has employed several methods including the use of SA to improve the efficiency and accuracy of the compensation process. The engineers at Electroimpact use several technologies to reduce machine compensation time, including SA to automate the machine compensation process. For example, SA’s measure stable point capability can be used to automate measurement triggering during the machine compensation process. Using this capability, SA takes a measurement every time the tracker detects that the target is stable, thus saving time and eliminating the need for manual triggering by an operator. For more sophisticated measurement sessions it is advantageous to close the loop of communication between the tracker PC and the CNC machine. This was done by using SA’s Measurement Plan custom scripting language in conjunction with a bespoke C# program. For advanced Measurement Planning uses, they’ve utilized SA training which accelerated the learning process with Measurement Plan implementation. Regarding technical support, engineer Rob Flynn finds the assistance he receives from New River Kinematics to be “consistently excellent.” “SA support engineers have often gone beyond the call of duty for us by providing support at odd hours, showing up on site to provide direct support, or by investing real engineering time into solving a problem,” he says.